The crew of the Ghost is assigned a simple milk run retrieving supplies for refuges on Lothal. But the trip takes the crew to Kaller, a planet connected to Kanan's past as Jedi Padawan Caleb Dume. Writer Greg Weisman and artist Pepe Larraz then take readers back to the days before Order 66 when young Caleb and his Jedi Master Depa Billaba fought to free the Kallerans from oppressive Separatist rule. Between action scenes, Padawan and Master discuss the nature of questions, dissent, attachment and the role of Jedi in the military. The issue ends as the infamous Order 66, which decimated the Jedi, is given to the Clone Troopers. Kanan: The Last Padawan was not what I expected. With a lead character from what is primarily a children's animated program, and with him as a kid, I expected something that was all-ages. Instead this title really is full of content that is somewhat above the average kid, discussions of attachment and the military obligation. There was also a lot more talking than I expected. I probably would not jump up and offer this as an all-ages comic. Now, I did read it to the Between Kid and the story kept the kiddo's interest. There are fighty fighty moments to keep the younger reader engaged. But honestly, I thought much of it above the Between Kid. I guess I should not have been surprises since the first Kanan story, Star Wars: A New Dawn, was very much a story written for adults. Weisman provides a strong and deeper than expected story. With Weisman serving as one of the co-executive producers of season one of Star Wars: Rebels I did expect the comic to share a similar feel with the animated series. Instead it really feels like what it is, a prequel story. I do like the fact that he plays up the fact that Caleb Dume is known for his questions, a personality quirk we see also see in Star Wars: A New Dawn. This story very much in line with that early prose novel. The art by Larraz feels like Star Wars (which to me is a very high compliment). Before there was Kanan Jarrus, there was Caleb Dume. 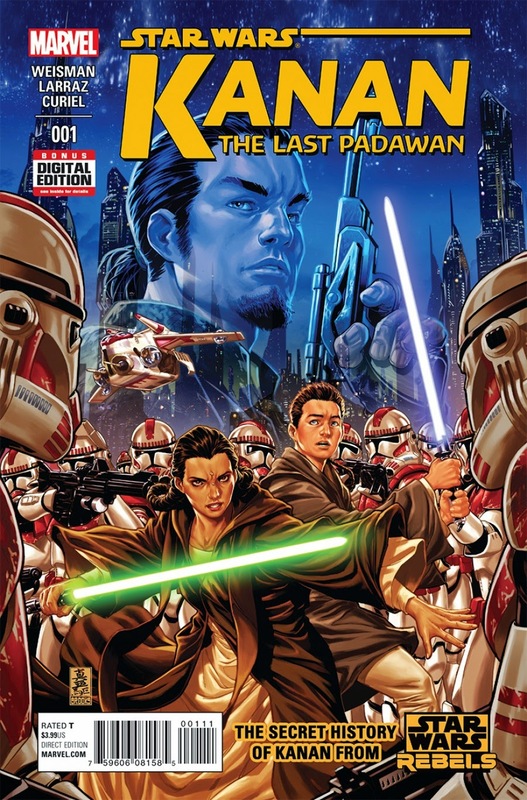 Kanan: The Last Padawan is setting up how the young Jedi student became the rebel we know from DisneyXD. I have been looking forward to this story. Though I will admit that I find myself surprised with the first issue as it provided philosophy and character development. And despite the heady topics in the comic's pages, in Betweenland at least one youngster (and adult) await the next issue.